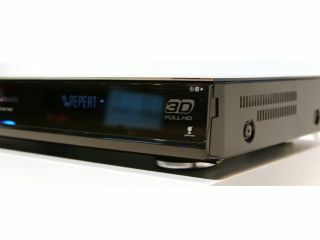 Panasonic's full-scale assault on the 3D Blu-ray market looks to be in full swing, with four new 3D Full HD compatible Blu-ray players announced. The imaginatively titled MP-BDT900-K, DMR-BWT3000, DMR-BWT2000 and DMR-BWT1000 were spotted at the Tokyo International Forum and come packed with features. The most interesting feature being that the T3000, T2000 and T1000 all moonlight as Blu-ray recorders and house a meaty amount of disk-space: 2TB, 1TB and 750GB respectively. The machines have Viera-link on-board, two HDMI ports (the T1000 has one) and there's even a component output on the T900. The recorders will be able to burn BD-R discs at 6x speed, while BD-RE discs will be burned in real-time. As these are Tokyo bound, there is no word on them reaching the UK. But the technology inside does give a glimpse as what we should expect to see when Panasonic release a 3D-ready Blu-ray player later this year.